Sometimes you can not get enough of a good thing! I love black and white...can't ever go wrong with a classic. I saw a similar combination in a magazine( stripes and spots) and loved the idea. To break up the stripes and the spots I added a ribbon around my neck ... a simple black ribbon can really go a long way( I've also worn this ribbon in my hair) . On rainy days like today I like to incorporate comfort into what I wear - Ill probably end up cuddled up some where eating baked goods. Tis the season to be enjoying and appreciating what we have - Stay Safe, warm and dry! Holla for rain boots! Your Hunters are great! I have a pair of red rain boots... thinking of just taking a label maker to them to give them a little upgrade! ;) Beautiful girl! So cute! I am in LOVE with your pink Hunter rain boots right now! You are beautiful! I love your pink rain boots and your little penny bracelet is so cute! simply in love with your pink hunters. i mean, they're absolutely amazing! I love hunter boots so much! Thanks for the follow and very cute braclet! That coin one is so unique! Love the mix of stripes and polka dots! I love black and white but its pretty that you added a touch of pink. You look so chic. I adore this outfit! So gorgeous! What a fabulous outfit! I love it! I love this look; mixing patterns is always one of my favorite things to do. And that penny bracelet is adorable!! big fan of your arm party! the coing bracelet is my favourite! That penny bracelet is super cute! Thanks for your lovely comment, I would love to stay connected, following you now on bloglovin' and gfc ! This is seriously adorable! I am so jealous of your boots!! I am now following you on gfc :) Thanks for stopping by my blog! This outfit is absolutely ADORABLE! Loving those pink Hunters, especially with the polka dots! I love your style, you look so pretty! :) I'm following now via GFC! You look adorable!! I will always and forever love stripes and polka dots!! LOVE the pink Hunters! Thanks for stopping by my blog! Love these boots and your great sense of style.Would definitely love to follow one another. I'll add you through GFC and Bloglovin! Don't forget to return the love and take care! OMG you're one very pretty lady....nice to invite me here!!! I love your ultra cute pink HunterS!!!! You are so beautiful!! I would love to follow one another, in fact I started now, waiting for you to do the same!! Keep up the good work with your blog, you'll go far! OMG love your pink Hunters! :) Your blog is absolutely fabulous-just became a member/follower of your blog. I hope you'll follow me back and we can keep in touch. Happy Blogging!!! I love your pink hunter boots! Thank you for your comment on my blog. Great style - feminine chic all the way! I am now following you, would love for you to follow me too. love the adorable bubblegum boots and the mix of polka dots and stripes! you look so cute! How funny that we both wore black and white polka dots + stripes! Great fashion minds think alike :) LOVE the pop of pink with the Hunters! You look so pretty! love your pink hunters, great look!! Thanks for your comment dear, and yes, we can fallow each other! I follow you now on bloglovin ;) hope you follow me back! Wauw, i love your outfit! Hi dear ! Thanks the visit on my blog, sure we can follow each other! Love this look! Those pink Hunters are perfect with the black and white. I am now a follower! hi dear :) youre beautiful! I follow your blog. Absolutely gorgeous! 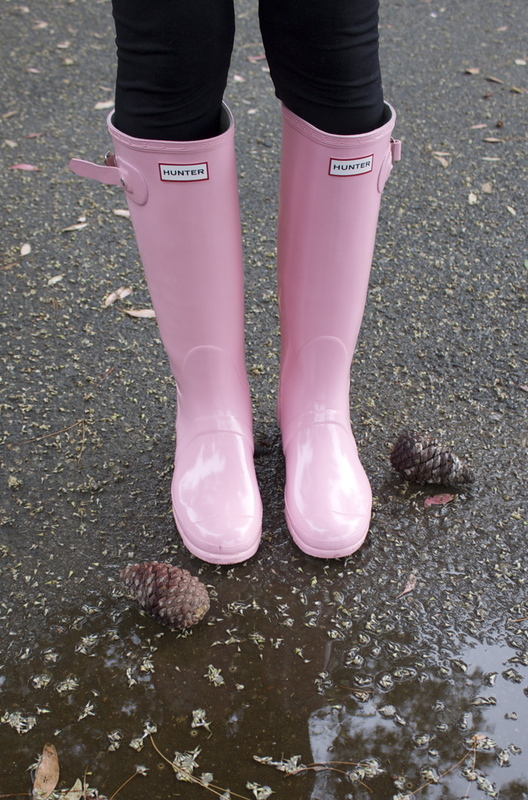 I'm in love with the pink Hunter boots! Thanks for visiting my blog,Now following! thxx for your comment on my blog! I love the Hunter galoshes. The blue and the baby pink go great together. Would love to follow each other on Bloglovin and GFC. I am following you now. Thanks for commenting on my blog. Im following you now. Let me know if your doing the same. que gran look! tus botas son geniales! I love the classy black and white combo and how you layered this! And I REALLY love those baby pink hunters! Beautiful! This is so cute! I love stripes and polka dots and the pink Hunter boots are perfect! Nice outfit! Ok I follow you via gfc and bloglovin! I'm following you via GFC, bloglovin! Cool pics!! =) perfect outfit for a rainy day!! I am loving the stripes and polka dots. Also, that penny bracelet is too cool! I love unique things and I've never seen anything like that before. this look reminds me Hello Kitty! Girl..let me tell you something..
Let me know about following eachother! I love your shirt and sweater! Those colours were good enough for Chanel so they're good enough for me! Thanks so much for your lovely comment. Of course we can follow each other. I'm following on GFC now, I hope you do the same! you're gorgeous! i love the whole outfit especially the boots! thank you for commenting on my blog, i really appriciate it! And all the information is there :) Enjoy! I love stripes and dots together! amazing style!! I'm in love with this look:) I would love to follow each other dear!! :)) just let me know once you follow me and I will follow you right back!! :) happy week! Gladly Follow you. Hope you can follow me back. Following you on Blog Lovin' now!! :) Love this outfit--especially the pink Hunter boots! CUTE! loving your mixing of prints! this looks great for the rain. You look beautiful! I love the mixed prints and pop of pink! You look great! Can't go wrong with black and white and pink! Your pink rain boots are adorable! And thanks so much for the sweet comment on my blog! Yes, of course I would like to follow each other!! I'm starting now and look forward to you following back! I follow you on Bloglovin, follower 60! Adorable look, the stripes and polkas totally work! Come on by if you have time, maybe we could follow each other? I love your Hunter boots. Recentlu bought my first Hunters and I absolutely adore it! I love this look, and I'm absolutely loving your blog. We have very similar style.